This paper presents a particle swarm optimisation (PSO) based multi-objective feature selection method for evolving a set of non-dominated feature subsets and achieving high classification performance. Firstly, a multi-objective PSO (named MOPSO-SRD) algorithm, is applied to solve feature selection problems. The results of this algorithm are then used to compare with the proposed multi-objective PSO algorithm, called MOPSO-SiD. MOPSO-SiD is specifically designed for feature selection problems, in which a subset similarity distance measure (distance in the solution space) is used to select a leader for each particle in the swarm. This distance measure is also used to update the archive set, which will be the final solutions returned by the MOPSO-SiD algorithm. 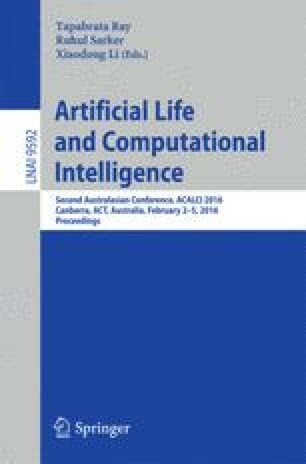 The results show that both algorithms successfully evolve a set of non-dominated solutions, which include a small number of features while achieving similar or better performance than using all features. In addition, in most case MOPSO-SiD selects smaller feature subsets than MOPSO-SRD, and outperforms single objective PSO for feature selection and a traditional feature selection method.